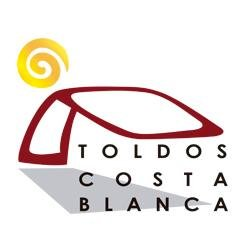 With more than 40 years experience Toldos Costa Blanca are the leading manufacturers, suppliers and fitters of all types of awnings, pergolas, car ports, drop down blinds, sun shades and sails. Continuing expansion of our business would not been possible without the quality of our product. 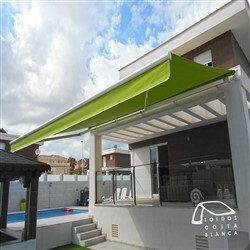 We use only top quality acrylic fabric with UV protection of UPF 50+, this means your awning will not discolour or fade plus all our products are manufactured in our own factory on the industrial estate in Santa Pola near Alicante. 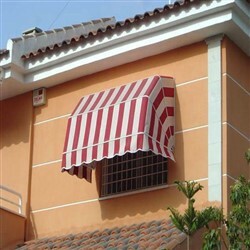 We fit awnings in all these areas: Denia, Benidorm, Alicante, Guardamar, Orihuela Costa and all the way south to Mazarron and Camposol. 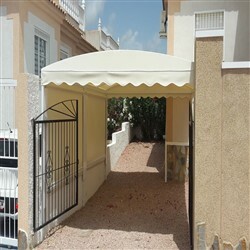 Window canopies and electric awnings, fully boxed to semi boxed to stand alone pergola structures and carports. Our professional technicians and multi-lingual sales team are happy to help you choose the right solution for your needs with all your requirements both understood and catered for.
" We offer a free no obligation quotation in the comfort of your own home "
Everything is made to measure in our factory giving you a quick turnaround with many clients being able to use their awning within a week. 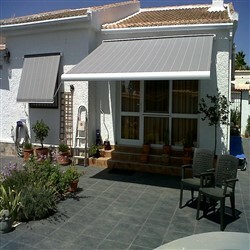 We also offer a two year guarantee on the installation and manufacture of all awnings fitted.